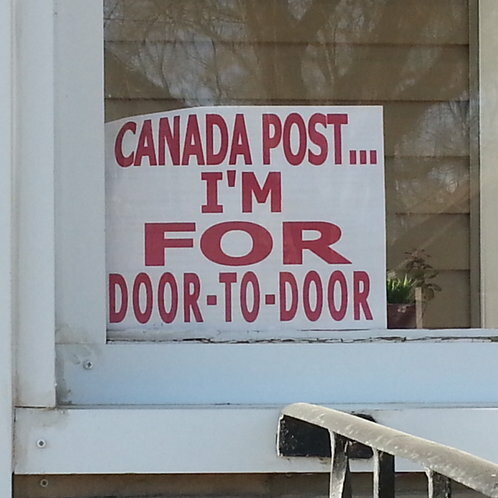 I have a real issue with the campaign to save door-to-door mail delivery by Canada Post. To me, it means we’re trying to live in the past. It means that regardless of the diminishing need for door-to-door mail delivery, and the increasing cost, we’re not willing to accept a necessary change in our lives. The world changes. The world has never and will never stop changing. I can think of all kinds of industries and profession that have entirely or mostly disappeared because they’re just not necessary or no longer efficient given current technology. Unfortunately, it seems, mail delivery can be added to this list. I was recently in the Dominican Republic and had the opportunity to see a sugar cane harvesting operation. Haitians are hired to cut the sugar cane by hand. Yes, there are great big machines that can do the job in a fraction of the time, but they’re expensive and Haitians aren’t. One of the reasons I also heard was that if the Dominicans bought the machines, the Haitians wouldn’t have jobs. This is poor reasoning in my mind, but I have to trust that it makes reasonable economic sense to the Dominicans. I suppose if we’re happy paying a dollar (and more) to send a letter and also subsidize mail delivery with junk mail in order to have very well paid people bringing our mail to our doors, then I guess that’s what we’ll do. But if we can start living in the present and planning for the future, I think we’ll find acceptable, efficient and effective methods of communicating without the need for personal delivery of physical items. 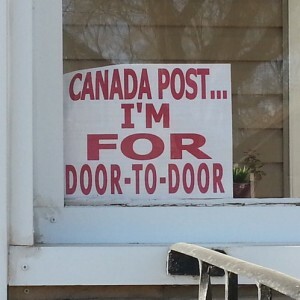 This entry was posted in Opinion, People and tagged Canada Post, door-to-door, economy, mail.